Highly demanded in the local marketplace; our wooden cable drums have emerged as the newest hit in the modern times. Great by looks, our wood cable drums have been composed as per modern styles and trends. Our wide ranges of wooden drums are available in attractive shapes and sizes. Modern ways of manufacturing make our products simply astonishing. You will be pleased to know that our splendid product âï¿½ï¿½range is sufficed at the least rates in the market. 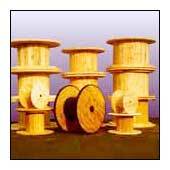 To add, we are a thriving cable drums manufacturer in the industry. Our identity as one of the suppliers of India has been regarded with huge admiration. These Cable Drums are used in cable industry like optical fibre cable, electrical cables.